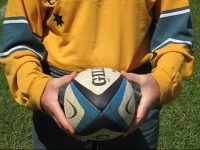 The spiral pass or spin pass is very useful in rugby. It's an advanced pass used to move the ball long distances, traveling fast, point first. It`s easier to make a good pass when you are confident about how you hold and handle the ball. Make sure you build your passing skills on good handling. and the things common to all good passes, rugby passing basics. The spiral pass and the spin pass are one and the same thing. 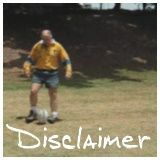 It`s used frequently in most top class games of rugby. You will find it useful in a wide range of situations. Backs tend to use it rather than the forwards. You use it particularly for fast delivery and for longer passes. It looks good and is useful when used between skillful players. It`s also good for quick line-outs. But it tends to be overused. When your target receives this pass the ball is spinning rapidly and is much more difficult to catch than a other passes. This is an advanced pass. Aim to perfect other passes before this one. This is especially true if you're a young player. Even if you have the best spin pass in the world it may harm your team effort if your team mates are unable to catch a spinning ball. Stand out by making others look good. Make passes they can catch! Remember, use the spiral pass or spin pass when it is the best pass for the job and when you are sure your target is able to catch a spinning ball. 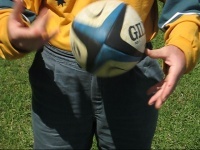 The actual spin is applied when you pull up strongly with the fingers of your outside hand, rotating the ball by rolling it off the thumb of your inside hand. Spin a rugby ball. Step 1. Try this first, so you get the ball spinning. Use the "cage" grip (core skills page on handling explains this). I like to have each thumb on a seam and each set of fingers along a seam. 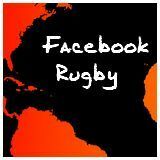 Spin a rugby ball. Step 2. 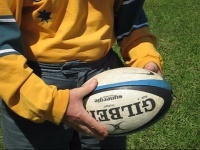 Change your grip slightly so you are holding the ball with just the fingers of one hand, just the thumb of your other. Spin a rugby ball. Step 3. With your thumb, apply slight pressure to help it stay in position when your fingers push the ball against it. With your fingers pull up and in - a flicking motion. Slightly "lobbing" the ball may help you keep control. Aim for a good even spin, rotating smoothly along the whole length of the ball. Change the fingers you use and the thumb you use and the ball will spin in the opposite direction. When you've got it, go back to the cage grip and now with all fingers and thumbs on the ball get the ball spinning. Practice this part of the pass before adding the swinging arms and pushing the ball to the target. Use two hands to grip the ball. Twist towards your target. You'll improves your aim and protect yourself in the tackle. Pull your arms to one side of your body then throw your arms back across in front of your body. Let go of the ball and follow through with your arms and fingers so your pass is accurate. Apply spin to the ball for improved speed and accuracy. 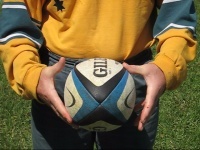 Players hold the ball in different ways when they spiral pass or spin pass the ball. You could try this one first. Your "outside" hand is more towards the rear of the ball, pushing towards the target, your fingers spinning the ball. Your "inside" hand is more towards the front of the ball, your thumb helping to spin and your fingers guiding the ball. You can do it just as well with the cage grip and the ball turned legthways across your body. Use it for medium to long passes. The longer your intended spiral pass or spin pass the more you need upper body and arm strength. You can practice the spin pass alone. Simply pass the ball vertically. Aim to send it straight up like a rocket, spinning as it goes. Then for the real pass just adjust your arms to send it to the target. That`s the spiral pass. It`s good and useful - but not for all situations! and put them in a spin with a side step!